Yesterday, I got my Zaycon order of kielbasa. It was a 10 pound box, most of which I will grill with the hot dogs I also got. However, I caught part of a clip on TV of someone preparing kielbasa and pierogies. So, I did a little searching and found that combo also with cabbage and carrots. So, I got a bag of frozen pierogies to give it a try. It turned out really good, filling and flavorful. Plus, it was pretty easy to make and ready in about 30 minutes. Heat olive oil in a large skillet over medium heat. Add onions and carrots, and cook until onions are soft and translucent. Add chopped cabbage, salt and pepper to taste, and cover skillet. Cook, covered, for 10 minutes or until cabbage is soft. Slice kielbasa into 1/8 inch thick slices. Add to skillet. Cover and cook another 10 minutes or until kielbasa is cooked. Meanwhile, in a separate skillet or pot, prepare pierogies according to the directions on the package. 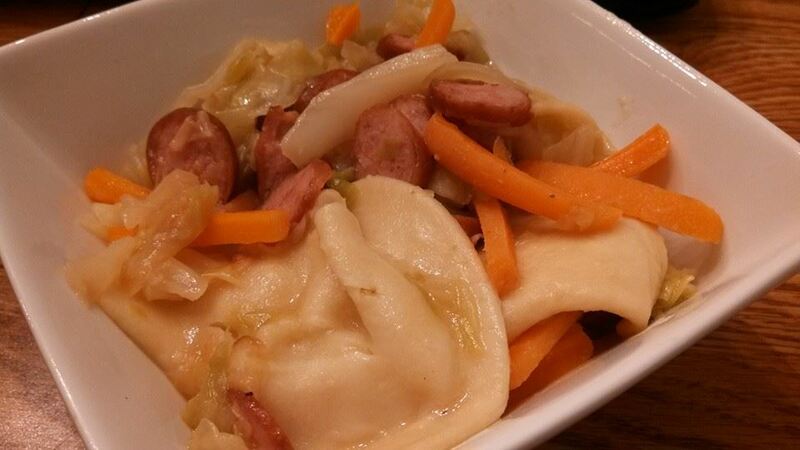 Add pierogies to the cabbage and kielbasa. Cook an additional 5-10 minutes.